A Black Bear (Ursus americanus) eating dandelion flowers in EC Manning Provincial Park, British Columbia, Canada. I have not really had much opportunity to photograph Black Bears (Ursus americanus) before – last year was the first time I’d seen one. Since then I’ve seen maybe a dozen, and this one was certainly the largest. I do not know if this is a “large” black bear, but it certainly was not skinny like some of the ones I came across last year. This one was wolfing down dandelion flowers along the side of the Crowsnest Highway in Manning Provincial Park in British Columbia, Canada. I was well across a 4 lane highway with my 70-200 + 1.4x Extender (53 feet away for this shot). This felt sufficiently distant enough to get a decent photo and to not disturb the bear. Unfortunately, not everyone there took the same precautions. 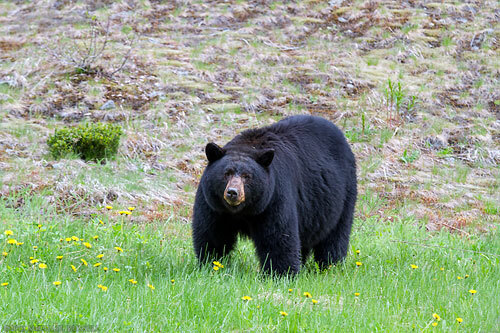 After I had photographed the bear for several minutes a woman pulled up beside the bear on the shoulder. No safe distance, no apparent thought to anything but photos with her iPhone. The guy behind her tried to get her attention and waved, yelled a bit, then honked his truck horn. It seems he thought she was too close as well. She ignored this. When the bear walked about 10 feet forward, she rolled her car right along side… probably 8 feet away. Before this happened, her child started hanging out the backseat passenger window, on the same side of the car as the bear. I then honked my horn once, and she got angry this time and yelled back that I could get my photos later. I guess she thought my concerns were that she was now blocking my photography, which she was, but I had not really considered this yet. She eventually left after a few minutes of what I am sure were “high quality” iPhone snapshots, never did get her kid back into a seatbelt, and sped away, but not before giving me the finger of course. Through all of this the bear never stopped eating his dandelions and seemed to only give the humans around it an occasional glance, and usually only when a very large truck flew by. 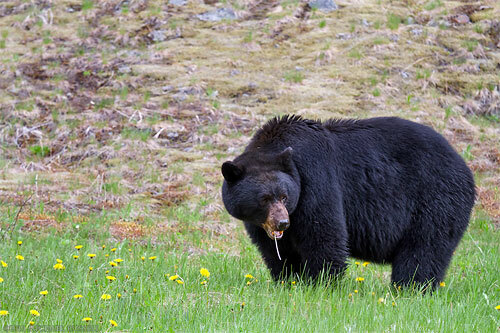 The sad part about this is that this bear is most likely used to such behaviour, and idiots on the side of the road dangling fresh meat their children out the window don’t even get its notice. I guess that last item was a good thing. I have a bit more understanding now when I read stories by frustrated photographers in popular parks like Yellowstone where this kind of thing probably goes on every day. See more of my Wildlife Photography.